The Golf might get all of the glory, but the Jetta is, and always has been, the sales star in Volkswagen’s North American crown. A small sedan formula that was an instant hit when it was first introduced in the ’80s, the Jetta managed to provide a European alternative to the more utilitarian Japanese compact cars flooding the market — and in doing so tapped into a tuning subculture that was searching for a four-door hero. *Not really. Even though naming cars after ocean currents and trade winds (Scirocco, Passat, etc) is Volkswagen’s go-to for small cars, former VW employees long ago debunked the idea that the Jetta’s moniker came from a similarly celestial source. In fact, the Volkswagen Jetta has had more than 10 different names in multiple markets over the nearly 40 years it’s been on the market, including the Atlantic, the Fox, the Bora, the Vento, the Sagitar, and Clasico, and the Voyage. At the very least, Vento means wind if you happen to speak Italian (or Portuguese). Where did the Jetta come from? Quite simply, when the small sedan segment started to grow in the United States at the end of the 1970s, Volkswagen realized that it had nothing to offer entry-level buyers aside from the hatchback Golf. The quick and easy solution was to borrow the Golf’s platform, slap on a trunk, and offer it as both a coupe and a four-door sedan. Thus was born the 1981 MK1 Jetta, which, like its hatch sibling, was designed by Girogetto Giugiaro. Take a moment to ponder the fact that the two-door MK1 replaced the Volkswagen Beetle in North America as the first new compact coupe design to be made available from VW since the Bug originally went on-sale in the 1950s. Very few evolutionary leaps in the automotive world have ever been that enormous, before or since. Even more impressive? The Jetta would eventually outsell the Golf as Volkswagen’s most popular model in the U.S. The first-generation Volkswagen Jetta would be sold until the ’84 model year with a number of gas and diesel four-cylinder engines available under the hood, but by the end of its initial run, VW elected to spice things up with the Jetta GLI. Borrowing again from the Golf playbook, the GLI stole the GTI’s 90 horsepower, 1.8-liter four-cylinder engine, matched it with a five-speed manual gearbox, and tuned the suspension by way of swaybars at both ends plus upgraded shocks and coils. 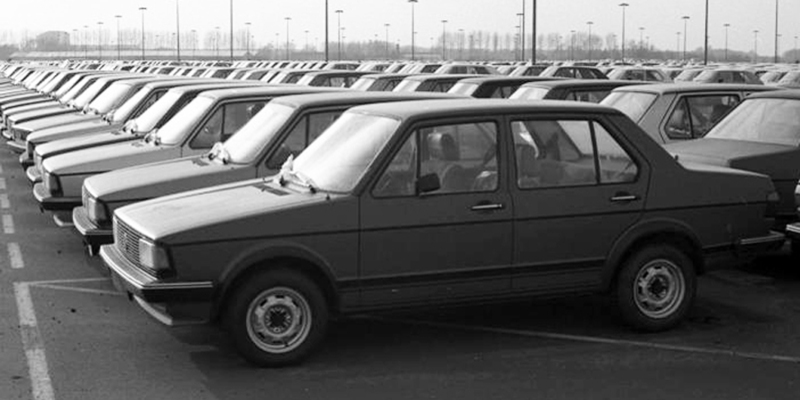 With the American demand for the Jetta firmly established, Volkswagen rolled out the MK2 generation in 1985 to considerable acclaim, outselling every other European car until it was retired after the 1992 model year. Bigger than the original in almost every dimension, the Jetta continued to combine a low price with respectable practicality and affordable fuel mileage. This was especially true of turbodiesel versions of the car, which didn’t offer much in terms of performance but squeezed ridiculous mileage out of a tank of fuel, especially on the highway. Just over 1.7 million MK2 Jettas were sold. Despite the success of the MK2, nothing else in Volkswagen’s stable really caught the imagination of North American buyers, leading to a precipitous drop-off in sales in the early ’90s. Enter the 1993 Jetta MK3, a rounded design that wasn’t quite as eye-catching as the model it replaced, but one that was popular enough to not only outsell the Golf at nearly two to one but also convince the German automaker not to pick up its marbles and head back to Europe. It was also the generation of Jetta that took diesel mainstream: the 1.9-liter four-cylinder turbodiesel offer with the MK3 maintained its reputation for extreme mileage while adding in a level of acceleration and performance that was on par with gasoline engines of the era. For those involved in the import tuning scene in the late ’90s and early 2000s, few battles raged as hard on internet messaging boards and in the parking lots of local cruise-ins as the fight between Volkswagen’s VR6 and 1.8T engines. Although the GLI took a generation off for the MK3 Jetta, VW introduced the GLX trim that could be equipped with the VR6 six-cylinder high-performance engine. This narrow-angle mill had become a street legend among the compact performance crowd thanks to its ability to produce 201 horsepower and nearly as many lb-ft of torque, depending on which year Jetta it was installed in (and how many valves per cylinder it boasted). The 12-valve and 24-valve VR6 engines gained a solid following as the Millennium crept into view, and the engine carried over from the MK3 to the MK4 Jetta when the redesign hit in 1999. The MK4, however, marked the first time that the 1.8T turbocharged four-cylinder also became available in the Jetta lineup, and while at first its 177 horses and 172 lb-ft of twist seemed inferior to the larger six-cylinder, the tuning crowd quickly discovered just how amenable the turbo motor truly was to pushing out more than factory spec power. Prized for being lighter than the VR6, and less expensive to modify, the rivalry would rage on for the next half-decade. Every once in a while, an automaker will sell a previous model alongside its redesigned sibling as a way to either reduce old stock or serve a built-in audience for that particular vehicle. When Volkswagen introduced the City Jetta in 2007, however, it took this thinking to a new extreme. With the MK5 Jetta larger than ever before, VW felt that it needed a way to stay in touch with Canadian buyers seeking a small sedan, and so it reintroduced the MK4 alongside the new car under the City Jetta name. This was made possible because the MK4 was still being built for a handful of markets to the south (including Brazil). A similar strategy was employed for the City Golf, with both models featuring a lower standard of equipment both inside and under the hood. Things got even more confusing for Volkswagen Jetta fans with the introduction of the Sportwagen as a 2007 model. Initially sold only in Canada, the Sportwagen was actually a renamed Golf wagon, imported from Europe, as opposed to past wagon versions of the Jetta that were long-roof versions of the sedan. Strangely, although the Golf-based Jetta Sportwagen would reach American buyers in 2011, by then it had already been renamed the Golf Sportwagen back in Canada, with the unification of the model under the Golf banner not occurring in both countries until the vehicle’s redesign in 2015. Prior to the revelation that Volkswagen’s turbodiesel engines had been rigged to cheat EPA emissions tests, the company was all-in on its TDI initiative, including sponsoring a Jetta TDI-specific racing series called the Jetta TDI Cup. Featuring street-legal, lightly modified versions of the sedan, the Cup was an affordable gateway to racing for many younger drivers seeking a taste of the sport. In fact, you had to be between the ages of 16 and 26 to compete. The series ran for three years (2008-2010) and spawned a Jetta TDI Cup Edition commemorative model that featured a sporty body kit (but not much else in the way of performance-enhancing gear). The current Volkswagen Jetta stumbled a bit when it left the gate as a 2011 model when the automaker decided to push the sedan down-market in terms of comfort features and materials. Although the Jetta was larger than any that had come before it, a less sophisticated chassis combined with a bargain-oriented cabin and rough five-cylinder base engine turned off loyal buyers to the point where, just a few short years later VW, had installed a new turbo four as its entry-level engine, added a rear multilink suspension system, and introduced special models like the Jetta Sport to go along with the revived GLI.